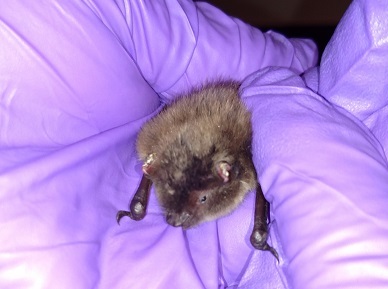 On Friday January 15, 2016 a biologist from the Vermont Fish and Wildlife Department was doing a survey of the bats in one of the hibernation caves when she found 2 endangered little brown bats hanging on the rocks outside the cave. We have named the Batman and Robin because they came from a cave. They should have been fast asleep inside the cave but something had caused them to leave. The cave that they were in is known to have the fungus that causes white nose syndrome (Pseudogymnoascus destructans or Pd) in it and many thousands of the bats from that cave have died over the past 5 years. Batman and Robin had been infected with the fungus and were confused, hungry and very cold. So cold that Robin had frostbit on both ears. The temperature was going to drop well below 20 degrees and both bats would have died that night. 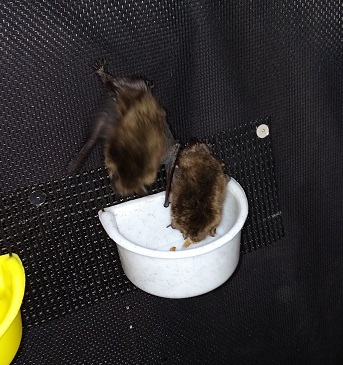 The biologist rescued them and made the 3 hour drive to bring them to the Vermont Bat Center. These two bats presented us with a big problem at the Center. They were endangered species and they were also infected with the Pd fungus. Bats with the Pd fungus must be completely isolated from all the other bats at the Center. They must be in a different room, with different cages and different equipment. 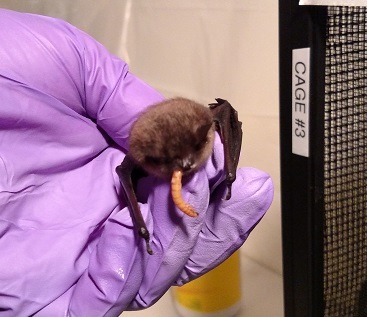 Nothing from their isolation area can be carried to the area that has other bats in it. 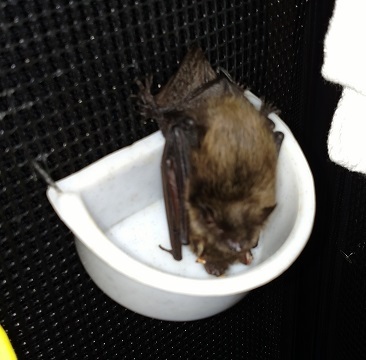 Our staff cannot go from the isolation area to the area with other bats without being completely disinfected. Even the rubbish must be disinfected before it is removed. To further complicate things at the center, the isolation area needs to be very warm and humid to help the infected bats fight off the effects of the fungus. 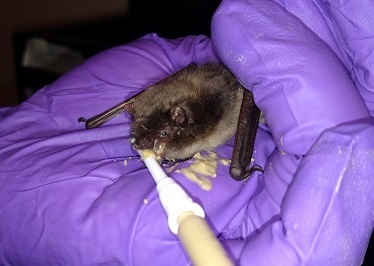 Bats have a very strong immune system that can defeat the fungus if they are well fed and are in a warm, humid place. 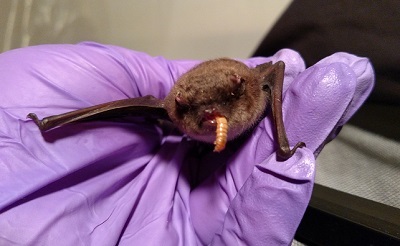 Unlike the other healthy bats at the Center that are hibernating in our cold area (46 degrees), Pd infected bats will remain awake all winter so they are able to fight the effects of the fungus. At the Center we had to create a new isolation area for these endangered bats so they would have a chance to survive. 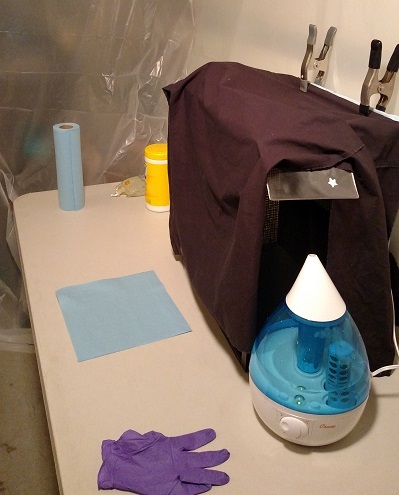 We quickly built the isolation room with its own humidifier and heating unit to get ready for these guests. 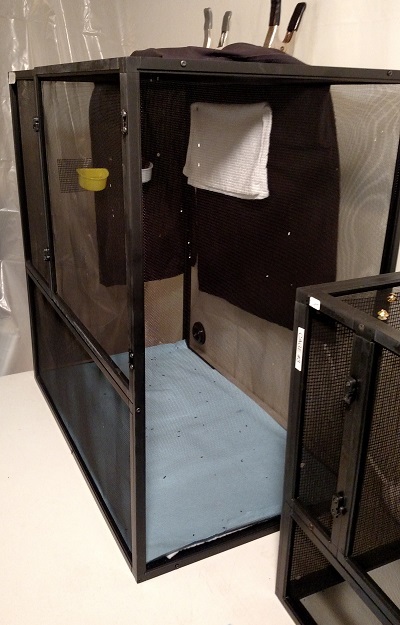 We have also ordered larger cages since they will be with us until May and will be awake the whole time. They need a space large enough for them to take short flights and allow us to give them some interesting things to explore during their long recovery. 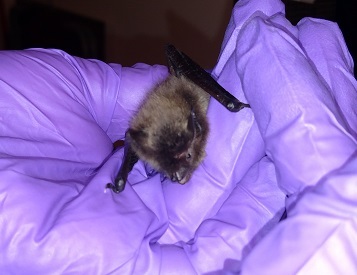 As the biologists check more of Vermont’s hibernation caves they will almost certainly find more of the endangered and threatened bats that are in need of critical care. We will be ready to help them.